Edit: this image was selected as post of day for both the Karma ( http://www.flickr.com/groups/karma/ ) and Spectacular Animals ( http://www.flickr.com/groups/spectacular_animals/ ) groups, thanks so much I am honored! And now it has also been selected for photo of the week at Karma, thanks again! 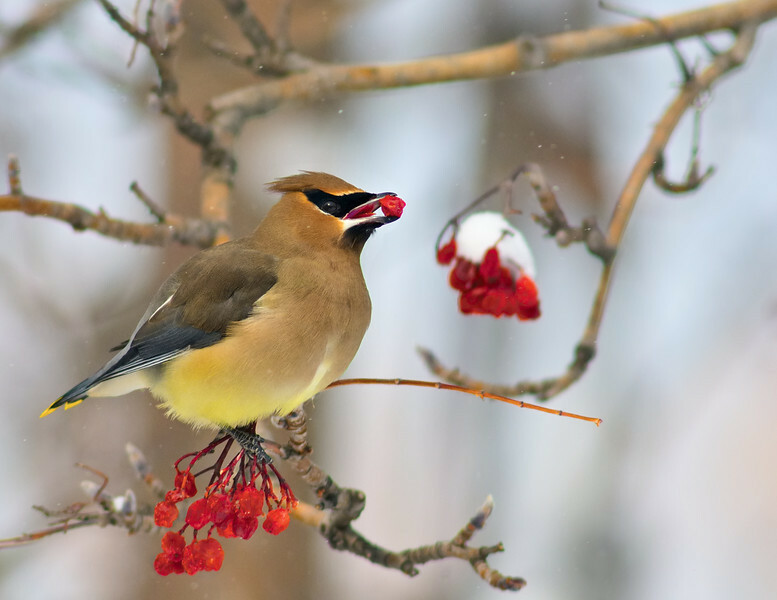 Image Notes: The only really tricky thing about these waxwing captures is not blowing up the intense oranges and reds of the mountain ash berries, even straight from cam. If you have Photoshop, I have found this recent TLR taming out of gamut colors tutorial ( http://www.thelightsright.com/TameOutOfGamutColors ) very helpful.